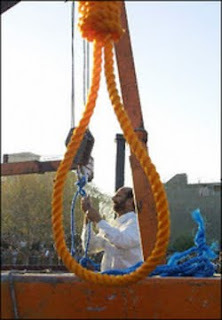 So it is true, the IRI encourage renegade retaliatory murders in the name of 'Islamic Justice' ('Ghesas'/'Qesas') by legislating (Article 14 Islamic Penal Code of Iran) the permission of a civilian family placing a noose around the neck of behnood Shojaei - the condemned - and kick the stool from under him, leaving him dangling to his death. 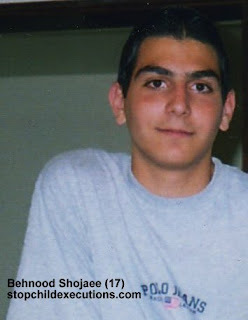 Behnood Shojaei was convicted of what could arguably constitute manslaughter, when he was involved in a fight where the other party died as a result of his injuries. Shojaei was 17 years old at the time. Under Article 37(a) of the Convention on the Rights of the Child (CRC), it is forbidden to condemn Shojaei to death. Under the law of Ghesas, the victim's family can either accept compensation; forgive him; or demand his execution. Shojaei was stood on the hangman's stool five times in the past; however, this time he was hurried down to the execution quarters at 0500hrs, where the mother of the victim placed the noose around his neck and kicked out the stool from under him. Does this act not make her a murderer too? The fact that the IRI allowed her to be the executioner renders the state complicit of this murder, does it not? It is understandable that one would be overwhelmed with emotion and want revenge; however, that is why there is the rule of law, to ensure justice is served through reason, and not through violence and emotion. The IRI government has overlooked the whole rationale for the rule of law, and endorsed an emotional and impulsive knee-jerk reaction to crime. In short, the IRI has yet again flouted the international law of the Convention on the Rights of the Child - Article 37(a) where no one may be executed for a crime committed when they were under the age of eighteen - and sanction retaliatory murder. Where was the United Nations to protect their convention, and in effect protect Shojaei? 26 juvenile executions have taken place since the IRI ratified the CRC in 1994; what has the U.N. done about this? Not much. In 2005, the Committee on the Rights of the Child held their thirty-eighth session, where the Concluding Observations on the IRI was reported. A copy of this report can be accessed here. Paragraph 29 of the report expresses that the Committee "deplores the fact that" juvenile offenders are still executed; however, there is no mention of enforcing this rule of law. Instead, paragraph 30 "urges" the IRI to cease such practices. One will find this reiterated throughout the seventy-eight paragraphs of the report - paper tigers; all growl and no bite. How many more juvenile executions need to take place before the international community, and the U.N. legislators, intervene? How many more human rights abuses ought to occur before human rights is protected and promoted in Iran? One death is one too many, let alone the innumerable deaths and violations of human rights that have taken place over the past thirty years in Iran, courtesy of the IRI government. The United Nations inability to enforce the very laws they legislated to protect human rights is, somewhat in effect, as if they let Shojaei, and the many more like him, be murdered by the blood-thirsty IRI regime.